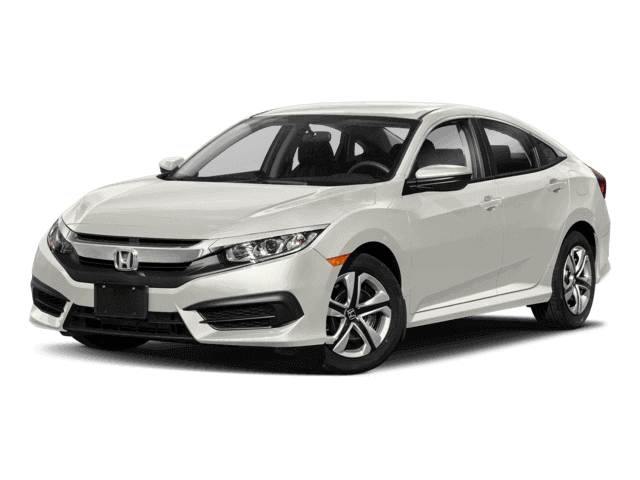 How does a 2018 Honda Civic Sedan compare to its competition in Safety Near San Antonio, TX? The Civic offers optional Collision Mitigation Braking System, which use forward mounted sensors to warn the driver of a possible collision ahead. If the driver doesn’t react and the system determines a collision is imminent, it automatically applies the brakes at full-force in order to reduce the force of the crash or avoid it altogether. The Mirage doesn\'t offer collision warning or crash mitigation brakes. The Honda Civic has Daytime Running Lights to help keep it more visible under all conditions. Canadian government studies show that driving with lights during the day reduces accidents by 11% by making vehicles more conspicuous. The Mirage doesn’t offer Daytime Running Lights. The Civic’s optional lane departure warning system alerts a temporarily inattentive driver when the vehicle begins to leave its lane and gently nudges the vehicle back towards its lane. The Mirage doesn’t offer a lane departure warning system. The Civic’s blind spot mirrors use wide-angle convex mirrors mounted in the corner of each side view mirror to reveal objects that may be in the driver’s blind spots. The Mirage doesn’t offer a system to reveal objects in the driver’s blind spots. The Civic EX/EX-T/EX-L/Touring has standard HondaLink Assist, which uses a global positioning satellite (GPS) receiver and a cellular system to send emergency personnel to the scene if any airbags deploy. The Mirage doesn’t offer a GPS response system, only a navigation computer with no live response for emergencies, so if you’re involved in an accident and you’re incapacitated help may not come as quickly. Both the Civic and the Mirage have standard driver and passenger frontal airbags, front side-impact airbags, side-impact head airbags, front seatbelt pretensioners, front wheel drive, four-wheel antilock brakes, traction control, electronic stability systems to prevent skidding and rearview cameras. The Honda Civic weighs 545 to 992 pounds more than the Mitsubishi Mirage. The NHTSA advises that heavier cars are much safer in collisions than their significantly lighter counterparts. Crosswinds also affect lighter cars more. Neck Stress 176 lbs. 435 lbs. Neck Compression 53 lbs. 68 lbs. Leg Forces (l/r) 192/350 lbs. 291/454 lbs. Neck Stress 131 lbs. 204 lbs. Neck Compression 46 lbs. 203 lbs. Hip Force 306 lbs. 519 lbs. Hip Force 356 lbs. 959 lbs. Hip Force 727 lbs. 970 lbs. For its top level performance in all IIHS frontal, side, rear impact and roof-crush tests, and with its optional front crash prevention system, the Insurance Institute for Highway Safety grants the Civic the rating of “Top Pick” for 2017, a rating granted to only 120 vehicles tested by the IIHS. The Mirage was not even a “Top Pick” for 2016. For enhanced safety, the front seat shoulder belts of the Honda Civic Sedan/Hatchback are height-adjustable to accommodate a wide variety of driver and passenger heights. A better fit can prevent injuries and the increased comfort also encourages passengers to buckle up. The Subaru BRZ doesn’t offer height-adjustable seat belts. The Civic offers optional Collision Mitigation Braking System, which use forward mounted sensors to warn the driver of a possible collision ahead. If the driver doesn’t react and the system determines a collision is imminent, it automatically applies the brakes at full-force in order to reduce the force of the crash or avoid it altogether. The BRZ doesn\'t offer collision warning or crash mitigation brakes. The Civic’s optional lane departure warning system alerts a temporarily inattentive driver when the vehicle begins to leave its lane and gently nudges the vehicle back towards its lane. The BRZ doesn’t offer a lane departure warning system. The Civic’s blind spot mirrors use wide-angle convex mirrors mounted in the corner of each side view mirror to reveal objects that may be in the driver’s blind spots. The BRZ doesn’t offer a system to reveal objects in the driver’s blind spots. The Civic EX/EX-T/EX-L/Touring has standard HondaLink Assist, which uses a global positioning satellite (GPS) receiver and a cellular system to send emergency personnel to the scene if any airbags deploy. The BRZ doesn’t offer a GPS response system, only a navigation computer with no live response for emergencies, so if you’re involved in an accident and you’re incapacitated help may not come as quickly. Both the Civic and the BRZ have standard driver and passenger frontal airbags, front side-impact airbags, side-impact head airbags, front seatbelt pretensioners, four-wheel antilock brakes, traction control, electronic stability systems to prevent skidding, daytime running lights and rearview cameras. Neck Stress 176 lbs. 263 lbs. Leg Forces (l/r) 192/350 lbs. 814/1004 lbs. Neck Stress 131 lbs. 135 lbs. Neck Compression 46 lbs. 92 lbs. Leg Forces (l/r) 445/224 lbs. 470/406 lbs. For its top level performance in all IIHS frontal, side, rear impact and roof-crush tests, and with its optional front crash prevention system, the Insurance Institute for Highway Safety grants the Civic the rating of “Top Pick” for 2017, a rating granted to only 120 vehicles tested by the IIHS. The BRZ was not even a “Top Pick” for 2016. Both the Civic and the Elantra Sedan have standard driver and passenger frontal airbags, front side-impact airbags, side-impact head airbags, front seatbelt pretensioners, front wheel drive, plastic fuel tanks, four-wheel antilock brakes, traction control, electronic stability systems to prevent skidding, daytime running lights, available crash mitigating brakes and lane departure warning systems. For enhanced safety, the front seat shoulder belts of the Honda Civic Sedan/Hatchback are height-adjustable to accommodate a wide variety of driver and passenger heights. A better fit can prevent injuries and the increased comfort also encourages passengers to buckle up. The Chevrolet Camaro doesn’t offer height-adjustable seat belts. The Civic offers optional Collision Mitigation Braking System, which use forward mounted sensors to warn the driver of a possible collision ahead. If the driver doesn’t react and the system determines a collision is imminent, it automatically applies the brakes at full-force in order to reduce the force of the crash or avoid it altogether. The Camaro doesn\'t offer collision warning or crash mitigation brakes. The Civic’s optional lane departure warning system alerts a temporarily inattentive driver when the vehicle begins to leave its lane and gently nudges the vehicle back towards its lane. The Camaro doesn’t offer a lane departure warning system. Both the Civic and the Camaro have standard driver and passenger frontal airbags, front side-impact airbags, side-impact head airbags, front seatbelt pretensioners, four-wheel antilock brakes, traction control, electronic stability systems to prevent skidding, daytime running lights and rearview cameras. For its top level performance in all IIHS frontal, side, rear impact and roof-crush tests, and with its optional front crash prevention system, the Insurance Institute for Highway Safety grants the Civic the rating of “Top Pick” for 2017, a rating granted to only 120 vehicles tested by the IIHS. The Camaro was not even a “Top Pick” for 2016. Both the Civic and the Mazda 3 have standard driver and passenger frontal airbags, front side-impact airbags, side-impact head airbags, front seatbelt pretensioners, front wheel drive, four-wheel antilock brakes, traction control, electronic stability systems to prevent skidding, daytime running lights, rearview cameras, available crash mitigating brakes and lane departure warning systems. Neck Stress 176 lbs. 232 lbs. Neck Compression 53 lbs. 70 lbs. Neck Stress 131 lbs. 213 lbs. Neck Compression 46 lbs. 78 lbs. Hip Force 306 lbs. 465 lbs. Hip Force 356 lbs. 575 lbs. The Civic offers optional Collision Mitigation Braking System, which use forward mounted sensors to warn the driver of a possible collision ahead. If the driver doesn’t react and the system determines a collision is imminent, it automatically applies the brakes at full-force in order to reduce the force of the crash or avoid it altogether. The Rio doesn\'t offer collision warning or crash mitigation brakes. The Civic’s optional lane departure warning system alerts a temporarily inattentive driver when the vehicle begins to leave its lane and gently nudges the vehicle back towards its lane. The Rio doesn’t offer a lane departure warning system. The Civic’s blind spot mirrors use wide-angle convex mirrors mounted in the corner of each side view mirror to reveal objects that may be in the driver’s blind spots. The Rio doesn’t offer a system to reveal objects in the driver’s blind spots. Compared to metal, the Civic’s plastic fuel tank can withstand harder, more intrusive impacts without leaking; this decreases the possibility of fire. The Kia Rio has a metal gas tank. The Civic EX/EX-T/EX-L/Touring has standard HondaLink Assist, which uses a global positioning satellite (GPS) receiver and a cellular system to send emergency personnel to the scene if any airbags deploy. The Rio doesn’t offer a GPS response system, only a navigation computer with no live response for emergencies, so if you’re involved in an accident and you’re incapacitated help may not come as quickly. Both the Civic and the Rio have standard driver and passenger frontal airbags, front side-impact airbags, side-impact head airbags, front seatbelt pretensioners, front wheel drive, four-wheel antilock brakes, traction control and electronic stability systems to prevent skidding. Neck Stress 176 lbs. 410 lbs. Neck Compression 53 lbs. 75 lbs. Leg Forces (l/r) 192/350 lbs. 572/327 lbs. Neck Stress 131 lbs. 139 lbs. Neck Compression 46 lbs. 99 lbs. Hip Force 306 lbs. 429 lbs. Hip Force 356 lbs. 847 lbs. For its top level performance in all IIHS frontal, side, rear impact and roof-crush tests, and with its optional front crash prevention system, the Insurance Institute for Highway Safety grants the Civic the rating of “Top Pick” for 2017, a rating granted to only 120 vehicles tested by the IIHS. The Rio was not even a “Top Pick” for 2016. Both the Civic and the Corolla have standard driver and passenger frontal airbags, front side-impact airbags, side-impact head airbags, front seatbelt pretensioners, front wheel drive, plastic fuel tanks, four-wheel antilock brakes, traction control, electronic stability systems to prevent skidding, daytime running lights, rearview cameras, available crash mitigating brakes and lane departure warning systems. Neck Stress 176 lbs. 362 lbs. Leg Forces (l/r) 192/350 lbs. 314/513 lbs. Hip Force 306 lbs. 412 lbs. Hip Force 356 lbs. 765 lbs. Hip Force 727 lbs. 868 lbs. For enhanced safety, the front seat shoulder belts of the Honda Civic Sedan/Hatchback are height-adjustable to accommodate a wide variety of driver and passenger heights. A better fit can prevent injuries and the increased comfort also encourages passengers to buckle up. The MINI Cooper Hardtop 2 Door doesn’t offer height-adjustable seat belts. The Civic’s optional lane departure warning system alerts a temporarily inattentive driver when the vehicle begins to leave its lane and gently nudges the vehicle back towards its lane. The Cooper Hardtop 2 Door doesn’t offer a lane departure warning system. The Civic’s blind spot mirrors use wide-angle convex mirrors mounted in the corner of each side view mirror to reveal objects that may be in the driver’s blind spots. The Cooper Hardtop 2 Door doesn’t offer a system to reveal objects in the driver’s blind spots. The Civic EX/EX-T/EX-L/Touring has standard HondaLink Assist, which uses a global positioning satellite (GPS) receiver and a cellular system to send emergency personnel to the scene if any airbags deploy. The Cooper Hardtop 2 Door doesn’t offer a GPS response system, only a navigation computer with no live response for emergencies, so if you’re involved in an accident and you’re incapacitated help may not come as quickly. Both the Civic and the Cooper Hardtop 2 Door have standard driver and passenger frontal airbags, front side-impact airbags, side-impact head airbags, front seatbelt pretensioners, front wheel drive, plastic fuel tanks, four-wheel antilock brakes, traction control, electronic stability systems to prevent skidding, daytime running lights and rearview cameras. Neck Stress 176 lbs. 318 lbs. Neck Compression 53 lbs. 60 lbs. Leg Forces (l/r) 192/350 lbs. 261/454 lbs. Neck Stress 131 lbs. 225 lbs. Neck Compression 46 lbs. 53 lbs.